This model is available as an automated tutorial by selecting Model Examples and Tutorials... > Structural Mechanics > Stress Analysis of a Thick Plate from the File menu. Or alternatively, follow the step-by-step instructions below. The elliptical shape can be constructed by first making two elliptical cylinders and subtracting the smaller inner one from the outer larger one. Press the Create cylinder Toolbar button. Enter 0 0 0 into the center edit field. Enter 0.4 into the length edit field. Enter 3 into the axis edit field. Approximation of curved boundaries can be improved by increasing the polygon resolution of the geometry object. This however will lead to an increased time and cost for performing geometry object operations. Enter 32 into the resolution edit field. An elliptical cylinder is easiest to create by scaling the unit cylinder. Select C1 in the geometry object Selection list box. Press the Copy and/or transform selected geometry object Toolbar button. Enter 2 1 1 into the Space separated string of coordinate scaling factors edit field. Enter 0.3 into the length edit field. Select C2 in the geometry object Selection list box. Enter 3.25 2.75 1 into the Space separated string of coordinate scaling factors edit field. To decrease the time and cost of the simulation, symmetry is utilized so that only a quarter of the geometry has to be modeled. To do this create a block overlapping one of the quarters, the use the Intersect tool to keep the overlapping objects. Enter 3.5 into the xmax edit field. Enter -0.1 into the zmin edit field. Enter 0.5 into the zmax edit field. Subtract the outer from inner cylinder, while intersecting the resulting object with the block. Note that the edges and dimensions of the inner cylinder and block are larger than required instead of parallel and in-line, for more robust geometry operations. Enter TF2 - TF1 & B1 into the Geometry Formula edit field. Select CI1 in the geometry object Selection list box. In order to create edges at z = 0, on which to impose boundary conditions, two parallel objects can be created by copying the first and offsetting it to the lower half plane. Select Copy/Transform Object... from the Geometry menu. Select the Make copy of geometry object check box. Enter 0 0 -0.3 into the Space separated string of displacement lengths edit field. The Gmsh external grid generation algorithm can be used for faster and more robust meshing. FEATool will automatically try to download and install Gmsh if it can not be found in the load paths. Enter 0.1 into the Subdomain Grid Size edit field. Select both subdomains in the Equation Settings dialog box and enter 0.3 for the Poisson's ratio and 2.1e11 for the Modulus of elasticity. Select the top boundary (number 2) and enter the -1e6 for the load force in the z-direction. Also fix the x and y displacements on the outer boundaries. Select 1 and 7 in the Boundaries list box. Due to the symmetry the x-displacement should be fixed on boundaries 5 and 10. Select 5 and 10 in the Boundaries list box. And similarly the y-displacement should be fixed on boundaries 4 and 9. Select 4 and 9 in the Boundaries list box. Select Add Edge Constraints... from the Boundary menu, and add the constraint w = 0 to fix the displacement in the z-direction of the outer horizontal edge at z = 0 (number 4). From the reference the stress in the y-direction at the inner point p = (2, 0, 0.3) should be -5.38 MPa. One can use the Plot Options to plot the y-component stress to visually confirm the solution. Select the Surface Plot check box. 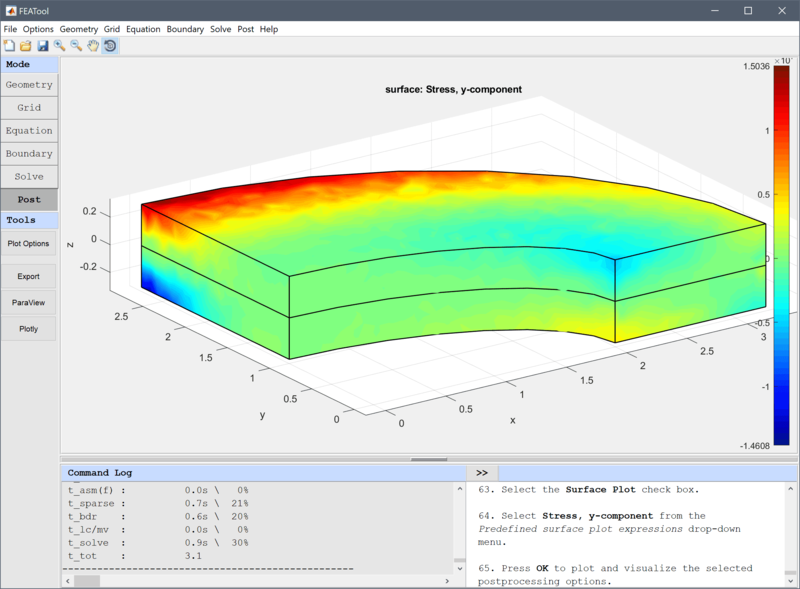 Select Stress, y-component from the Predefined surface plot expressions drop-down menu. Alternatively, the Point/Line Evaluation functionality can be used to evaluate and extract numeric values in specific points and on lines. Select Stress, y-component from the Evaluation Expression drop-down menu. Note that a small offset, such as +/-sqrt(eps) can sometimes be required to ensure the evaluation points are inside the domain. Enter 0.3 into the Evaluation coordinates in z-direction edit field. The stress analysis of a thick plate structural mechanics model has now been completed and can be saved as a binary (.fea) model file, or exported as a programmable MATLAB m-script text file, or GUI script (.fes) file. Davies G, Fenner RT, Lewis RW. NAFEMS Background To Benchmarks. LE10 Thick plate - normal pressure, 1992.